Did you ever notice my titles? Can you tell I really like alliteration? Rhyming and alliteration are always so fun to me. It drives my kids insane, especially my 17 year old. I'll be talking about something, making all my words start with the same letter and he gives me the old eye roll--oh well, anything I can do to make his life better:). Now that I've gotten that out of my system, I came across this cute snail that my youngest helped me with today. 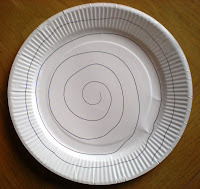 Take a small paper plate and draw a spiral pattern on it. 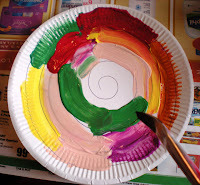 Next let the children paint the spiral to create the snail's shell. 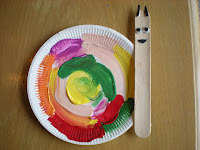 While the paint is drying, put a face on the tongue depressor. 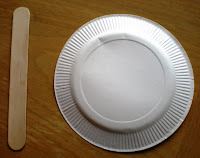 I used wiggle eyes, and some foam pieces I had laying around. 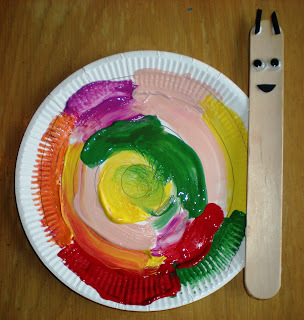 After the paint dries, put some tacky on the side of the plate and glue on the tongue depressor. He's good to go! 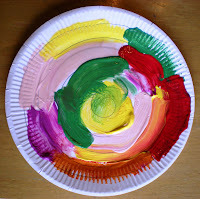 i'm going to have the kids do this today..to go with the snails they found outside. very cute! Very cool!!!! Who knew a snail could be so adorable??? 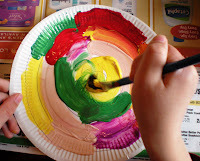 Your craft has been featured over at Daycare Spaces and Ideas!